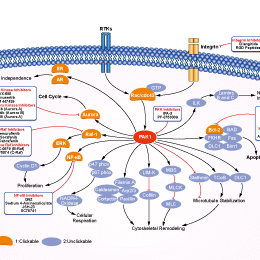 IPA-3 is a selective non-ATP competitive Pak1 inhibitor with IC50 of 2.5 μM in a cell-free assay, no inhibition to group II PAKs (PAKs 4-6). PF-03758309 is a potent, ATP-competitive, pyrrolopyrazole inhibitor of PAK4 with IC50 of 1.3 nM. (C) MEF lysates treated with 10 μM PF-3758309 and DMSO as control were loaded in a PhosTag gel. Phospho- and dephospho-proteins (PAK6 and 14-3-3γ) were visualized using anti-PAK6 or anti-pSer560 antibody and anti-14-3-3γ or anti-pSer58. Protein loading was controlled by western blot using anti-PAK6 and anti-14-3-3γ antibodies. KPT-9274 is an orally bioavailable small molecule that is a non-competitive dual inhibitor of PAK4 and NAMPT. It shows an IC50 of ~120 nM for NAMPT in a cell-free enzymatic assay. (e) FRAX597 (1 μM) for 1 h, and seeded onto Matrigel. 2F-2B cells were supplemented with exosomes (30 μg). After 24 h culture, tube formation was analysed and imaged. Scale bar = 50 μm. (representative images from n=3, *p<0.05, **p<0.01 and NS = no significant difference). FRAX486 is a potent p21-activated kinase (PAK) inhibitor with IC50 values of 14, 33, 39 and 575 nM for PAK1, PAK2, PAK3 and PAK4 respectively. FRAX-1036 is a potent and selective PAK1 inhibitor.